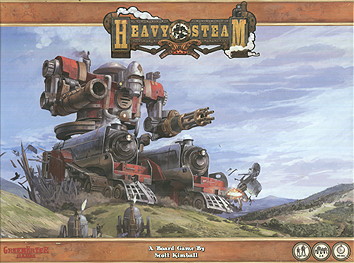 Set in a steampunk universe, Heavy Steam is a game about piloting a giant mechanical humanoid war-machine of doom. As a pilot, you use the steam titan's resources strategically to complete scenario objectives. More often than not it's to defeat your opponent, but you've never shied away from a fight, have you? In Heavy Steam, you are a pilot, commanding your own steam titan. Fully customise your steam titan: choose between powerful heavy titans or agile light titans, recruit a pilot, then outfit your titan with weapons of your choice. Plan ahead if you want to power your legs, weapons, or other systems. Simple yet robust dice-based combat, fun for everyone from newcomers to experts. Event cards, terrain cards, weapons and more keep the game fresh and new every time!